In the waning days of their colonial existence, Hong Kong and Macau were like mismatched cousins. Hong Kong was a roaring entrepôt of commerce while Macau was a sleepy backwater sustained mainly by gambling. Fourteen years after Hong Kong was handed back to China, and 12 years after Macau returned to Chinese sovereignty, the cousins are starting to look very different. Hong Kong is still holding its own as a dynamic industrial and financial center. But Macau has blossomed, becoming in many ways unrecognizable. In this paper, I seek to offer a brief explanation of the development of the two regions since the handover and explore some of the challenges each has experienced in the search for new and productive roles as Special Administrative Regions within the PRC. This search has provided an urgent impetus for both cities not only to identify and follow an appropriate and effective track on which to return to China, but more immediately to seek the appropriate role for their evolving integration into what has emerged as one of China’s most dynamic city-regions – the Pearl River Delta (PRD). Today the PRD, if we include the more than 7 million people in Hong Kong and the more than half-a-million in Macau, comprises a booming city-region with a population of more than 50 million. Its economic output and linkage to the global economy puts it at the leading edge of China’s remarkable economic growth. We estimate its contribution to China’s gross domestic product as roughly 10% of the nation’s total output. 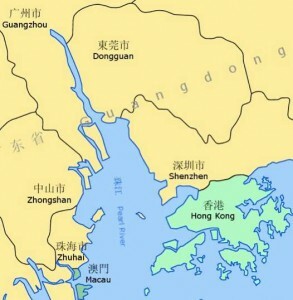 Hong Kong and Macau are located on the east and west flanks respectively of China’s Pearl River Delta. (Fig. 1) They are located at what may be viewed as the feet of two legs of a triangle with Guangzhou (Canton) at the head. These are three of the core cities of the booming city-region surrounding the estuary of the Pearl River in southeastern China’s Guangdong Province. Both cities share a European colonial heritage, but they are remarkably different in size, historical role and development, and economic trajectory. Hong Kong was returned to Chinese sovereignty in July, 1997; Macau followed two years later in December, 1999. Upon their return, both cities were awarded status as Special Administrative Regions (SAR). Their status as SARs, governed by a “Basic Law,” similar to a constitution, has allowed each to have 50 years of separate and semi-autonomous development within the larger context of being a legal part of China. Hong Kong’s colonial development began in 1842 following the Opium War and Britain’s desire for a commercial beachhead and deep port to advance its ambitions for the China trade. Initially limited to Hong Kong Island and a small piece of the Kowloon Peninsula, later treaties added offshore islands and the New Territories. Its growth and development progressed dynamically, although sometimes erratically, thereafter. Hong Kong’s role as gateway and sentinel for the China trade was rapidly propelled following the establishment of the People’s Republic of China (PRC) in 1949 and new China’s efforts to end the extensive commercial activities of Shanghai and other treaty ports along China’s coast. Once adjacent locations such as Zhuhai and Shenzhen were designated as Special Economic Zones (SEZ) in the early 1980s when China began its serious economic reforms, Hong Kong’s role as a source of capital, commercial knowledge and knowhow, and ties to the world economic system were crucial to China’s modernization efforts. These were greatly intensified after the two southern trips of paramount leader Deng Xiaoping in the early 1990s. Hong Kong has indeed been the tip of the commercial spear for China’s extraordinary economic development of the last 30 years. Macau was first established in 1557 as a tiny port and residential center for Portuguese traders who periodically visited the trade fairs in Canton (Guangzhou). The Chinese allowed them to stay there, although they exercised no sovereignty over the territory for more than three centuries. As was typical of both Portuguese and Spanish colonial efforts, Catholic missionaries soon followed, and Macau became a center for the activities for the Jesuits in East Asia. Throughout much of its history, Macau has struggled for financial resources to support itself. Traditional forms of Chinese gambling were tolerated early, and eventually these became a source of revenue. Hong Kong’s rise undermined the port and trading functions of Macau, and after 1842 Macau quickly became a stagnant backwater for a century-and-a-half. In 1962 a gambling monopoly was established with improved casinos and hotels; gambling was taxed and became an important source of revenue. At the same time, crime flourished and Macau developed a seedy reputation for its smoky and rough gambling casinos. Following the handover to China in 1999, the monopoly was ended and modern Las Vegas-style casinos were invited to share in the development of a new Macau. This has led to new prosperity and a transformation Macau has never before witnessed. In the 21st Century Hong Kong faces a number of challenges, and many emanate from the adjacent booming industrial and port cities next door, such as Shenzhen and Dongguan. What has happened since the Chinese economic reforms of the late 1970s, and more rapidly since Deng Xiaoping’s southern trip in 1992 where he implored China’s citizens that to get rich was glorious, is an explosion in the economic development of the Pearl River Delta. Manufacturing migrated from Hong Kong to the PRD where the costs of land, construction, waste removal and especially labor were much less expensive than in Hong Kong. Over three decades the PRD became the factory engine of China for many consumer products that were then re-exported through Hong Kong and more recently shipped directly from the PRD through container ports such as those attached to Shenzhen. Hong Kong has continued to prosper as it retained the headquarters role with management, finance, marketing and research and development functions of industrial enterprises still based there. The model became front office (Hong Kong ) and rear factory (Dongguan and Shenzhen in the PRD). The port of Hong Kong with its very modern container facilities burgeoned initially and became the world’s largest at the turn of the century. In recent years, this function has slipped relatively as Shanghai, Singapore and Shenzhen have enlarged their container shipping facilities and operations. Shenzhen, immediately adjacent to Hong Kong, is a serious rival, as its labor, port handling and transfer costs are lower than Hong Kong’s, and it continues to improve the quality of its customer services. Hong Kong’s shipping functions, while continuing to be very important to its economy, nevertheless are gradually diminishing, as their neighboring competitors ramp up their operations and efficiencies. Other key aspects of Hong Kong’s economy such as banking and finance, commercial services, tourism and retail continue to flourish, but they too are facing new challenges. While Hong Kong traditionally has been a key center for capital accumulation and the transfer of foreign direct investment into the Pearl River region, China today has accumulated huge foreign reserves and its dependence on Hong Kong to lead the way into linkages with the global economy has declined. Hong Kong’s role as a key banking and finance center remains in the lead, but again as China increasingly embeds itself in the global financial system, Hong Kong must move nimbly to ensure it has a role as interlocutor and middleman, providing negotiating skills and a vast array of brokerage services between China and other global economic powers. This role was crucial for China’s economic success in the 1980s and 1990s, but the maturing and expanding of economic reforms throughout China have reduced the importance of this need for Hong Kong’s intercession. Among Hong Kong’s challenges are the issues of its continuing democratic institutions as well as the social welfare of all its citizens. While its 50 years of separate development allow for the continuation of free elections and determining its own governance structure and processes, the shadow of mainland China always looms, and the extent of Hong Kong autonomy has never been entirely clear. At the same time enormous wealth has been created. There are many extremely rich people, yet there is also a substantial number of low-income people, and the distribution of wealth is very uneven. Hong Kong people see themselves as somewhat different from their mainland cousins, nevertheless their destinies are closely intertwined and mutually dependent. It seems clear that Hong Kongers must increasingly accept the reality of their gradual reintegration into China while working diligently to ensure it is a productive reintegration. Yet Hong Kong has many special and distinctive attributes that indicate it will continue to play a special role in China’s future. For example, it has placed increasing emphasis and investment in higher education through funding and expansion of its universities. This has included increasing stress on technical areas such as medicine, engineering, science and research. Many more students from the China mainland are coming to Hong Kong, and the Times of London Higher Education Supplement has given very high marks to some of the universities such as the University of Hong Kong for the quality of its programs, faculty, students and its research productivity. In this role Hong Kong, with its emphasis on the continued use of the English language as an international medium of communication for education, business, science and culture has been successful in maintaining a special role both within the Pearl River Delta Region as well as within the broader framework of developing China. Hong Kong’s story of growth and expansion as a British colony and its subsequent return to China is oft told and well-known. Among the most frequently discussed topics about Hong Kong is how it has fared under Chinese sovereignty. Macau’s is, in many ways, a much more intriguing and dramatic tale, especially since its return to the motherland. Ever since the establishment of Hong Kong around 1840, Macau has suffered from the presence of its larger neighbor. Small, and with a shallow harbor that was increasingly silted up, Macau formally came under Portuguese sovereignty in 1888, after almost three-and-a-half centuries of legal ambiguity about its status as way station for Portuguese and other foreign traders seeking entry to the Canton trading fairs. During Hong Kong’s rise, Macau became a poor backwater with a limited economic base, always searching for some way to make money and support itself. Gambling in dirty, dimly lit gaming houses and other sometimes nefarious activities resulted, and over time the territory earned a seedy reputation. Some improvements in the quality of gambling houses led to a few casinos after the appointment of a monopoly in 1962 to the Sociedade de Tourismo e Diversoes de Macau (Macau Tourist and Amusement Company) which introduced some of the western gambling games and provided new monies to improve infrastructure in the harbor and ferry landings. Yet during the last years of Portuguese rule, organized crime flourished, and the power of Chinese Triads grew. That led to shootings in the casinos and on the streets. After China took over in 1999, a more effective local administration quickly put a stop to the open crime and moved to improve the gambling scene. The STDM monopoly was ended, and new licenses were awarded in 2002 to a successor of the STDM as well as to two Western syndicates, Galaxy and Wynn, with the goal of expanding and modernizing the casino/gaming scene based on the Las Vegas model. Growing the gaming (now the preferred terminology for gambling, with gamblers now called “players”) industry in this way would also lead to increased fiscal resources and an attendant increase in public funding to develop Macau’s infrastructure and social services. Perhaps the most striking transformation is in the cityscape. New casinos and hotels are springing up, especially in the area called Cotai, a place created with landfill between the two islands of Taipa and Coloane that sit south of the Macau peninsula (Fig.2). Fig. 2. Macau. 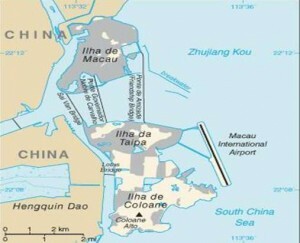 Area between Ilha da Taipa and Ilha de Coloane is Cotai landfill area on which are located many of the new casinos. usually stay at least three nights. They come to Macau primarily to gamble. Shopping, sightseeing and other recreational pursuits are low on the list of things to do. Most Macau visitors are also from China, and many literally walk into the SAR from nearby Zhuhai, as they pass through the China Gate where buses from the casinos will meet them and whisk them directly to a casino of their choice. Macau has never witnessed anything like what is happening today during its 450 years of colonial history. This new, unprecedented wealth and prosperity have changed this one-time backwater to the most favored spot in Asia and perhaps the world for those who wish to try their luck at roulette, baccarat, blackjack or a traditional Chinese game such as Sic Bo or even the old favorite of Fan Tan. A fiscal policy that imposed a gambling tax of 35% of gross casino revenue has provided the SAR with more than 75% of its overall revenues and allowed it to greatly upgrade infrastructure and increase the support of social services for the residents while keeping other taxes low. While the new wealth and prosperity have done many good things for Macau, there are also questions as to the social costs of gambling. Given that most of the gamblers come from China and Hong Kong, however, these costs are not likely to show up in Macau, but issues such as seriously addicted gamblers do not disappear, and the costs must be borne somewhere. Another emerging issue resulting from Macau’s new wealth is ensuring all citizens benefit. Improved social welfare programs and educational opportunities offer new prospects, but these must be comprehensive and sustained if they are to succeed. Meanwhile, the good times are rolling in Macau. Gambling is forbidden in mainland China, and the future looks very bright for continued growth in gaming and Macau’s related prosperity. While other competitors have recently emerged in Singapore, Taiwan, Philippines and Korea, Macau has established its reputation as the world’s premier gaming center, and its challengers can only marvel at its success. Today Hong Kong and Macau are both in the process of establishing their revised identities as Special Administrative Regions of China. Their colonial heritage and historical evolution give them a distinct character that offers both promise and challenge. Hong Kong’s role has been primarily commercial, and it was very important during the first three decades of economic reform in China. Today Hong Kong is expanding its role and identity as a global financial, commercial and educational center for southeast China and is a world city offering leadership for its neighbors in the Pearl River Delta region as they strive to integrate more closely with the global economy. Macau by contrast muddled along until after the handover in 1999. Its new identity has become that of China’s leading recreational and tourist center for gambling. So successful has this been that Macau has emerged as the world’s greatest and most advanced gaming center when measured by revenue turnover. The last decade has brought remarkable new prosperity but also new challenges in maintaining its distinctive and special character. It seems China is satisfied with the evolving role of both places and the gradual shifts in their functions and character as they renew their ties and establish their revised identities under the motherland. The Associated Press, 2011, as reported in the AJC June 7, “Singapore to take No. 2 gambling spot from Vegas,” http://www.ajc.com/travel/singapore-to-take-no-969644.html?printArticle=y. Bradsher, K. 2010. Hong Kong moves ahead on reforms. New York Times. June 21. http://www.netimes.com/2010/06/22world/asia/22hongkong.html?-r=1&ref=asia. GHK (Hong Kong) Ltd. (2008) Executive Summary. Study on Hong Kong Port Forecasts – Master Plan, 2005/2006. Healy, Tim (2004) “Big gamblers bet on Macau,” Wall Street Journal. March 5.
International Herald Tribune, (2006). “A $1 billion bet on Macao as the Las Vegas of the East.” September 5. Lin, George C.S., (2010) The Pearl River Delta in A New Geography of Hong Kong, eds. C. Y. Jim, Li Si Ming, and Fung Tung, Vol. 2. Cosmos Books, Hong Kong. Lin, George C.S., (1997) Red Capitalism in South China: Growth and Development of the Pearl River Delta. University of British Columbia Press. Vancouver, B.C. Loughlin, Philip H. and Clifton W. Pannell, (2010) “The port of Hong Kong: Past successes, new realities, and emerging challenges,” Focus on Geography. Vol 53, No. 2. Loughlin, Philip H. and Clifton W. Pannell, (2010) “Gambling in Macau: A brief history and glance at today’s modern casinos,” Focus on Geography. Vol . 53, No. 1. Porter, Jonathan, 1996. Macau, the imaginary city: culture and society. Westview Press, Boulder, CO. The Times Higher Education World University Rankings, 2010-2011 http://www.timeshighereducation.co.uk/world-university-rankings/2010-2011/top-200.html. Wan, Y.K.P., Li, X., and Kong, W. H. (in press), “The social impacts of casino gaming in Macao,” Tourism: An International Interdisciplinary Journal. Wang, James J. and Michael C. Cheng (2010). “From a hub port city to a global supply chain management center: a case study of Hong Kong” Journal of Transport Geography. Vol 18. Yee, Herbert S. (2001) Macau in Transition: From colony to Autonomous Region. Palgrave, Basingtoke, UK.